Pakistan Information MinistryA video tweeted and later deleted by the Pakistan Information Ministry shows an Indian pilot blindfolded and with a bloody face. Pakistan’s prime minister said the country would return a captured Indian pilot as a “peace gesture” towards resolving a flare-up in the Kashmir region. Wing Commander Abhinandan Varthaman was captured on Wednesday when the two countries shot down each others’ jets. 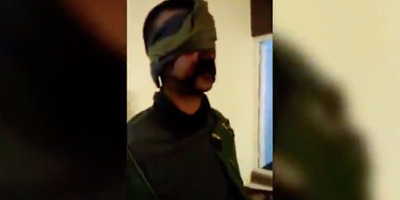 The pilot was shown blindfolded and with a bloody face in a since-deleted video shared by the Pakistan Information Ministry. A later video from Pakistan showed the pilot drinking tea, in which he says he is being treated well. Pakistan said it will release the pilot that it captured after shooting down an Indian plane, in what it said was a gesture to ease growing tensions between the two nuclear rivals. Pakistan’s prime minister, Imran Khan, announced that he would release the pilot, identified as Wing Commander Abhinandan Varthaman, on Friday as a “peace gesture” to India. Shortly after his capture, Varthaman was shown in video published by Pakistan with a bloodied face and wearing a blindfold – treatment which experts say could violate international treaties. India and Pakistan shot down its each others’ jets on Wednesday, during which confrontation Pakistan captured Varthaman. It was the latest clash since tensions soared between the two countries after 40 Indian troops were killed in a terrorist attack in the disputed territory of Kashmir on February 14. The country’s foreign minister previously said Pakistan would release him “if it leads to de-escalation” between the two countries, Reuters reported. Officials later shared a second video of the pilot, that shows him drinking tea and saying that Pakistan is treating him well. “I would like to put this on record & I would not change my statement if I go back to my country. The officers of the Pakistan Army have looked after me very well. They are thorough gentlemen,” he says in the video. General Vijay Kumar Singh, the Indian Minister of State for External Affairs, described the pilot as “embodiment of a mentally tough, selfless & courageous soldier” and called for his safe return. “During these testing times the country stands, as one, behind him & his family. Our efforts are on & under the #GenevaConvention we hope that the brave pilot would return home soon,” he said. Experts told The Washington Post that Pakistan may have violated the Geneva Convention by sharing the video that shows the pilot blindfolded. 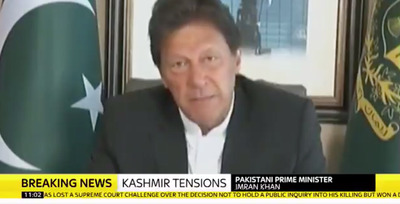 Sky NewsPakistani Prime Minister Imran Khan addressed the nation on Wednesday and said India and Pakistan should sit down and talk. Modi said: “When our enemy tries to destabilize the country, when terrorists attack – one of their goals is that our progress should stop, our country should stop moving ahead,”CNN reported. The US, the EU, and China, urged both countries to have restraint and to avoid any military escalation.